On Monday, February 19, eight anti-racist activists are returning to court for trial following the people’s removal of the confederate statue from in front of the old Durham Courthouse on August 14, two days after white supremacists and Neo-Confederates terrorized, occupied, and brutalized the residents of Charlottesville, VA, resulting in the murder of anti-racist activist, Heather Heyer. Community members will gather outside for a brief press conference before trial begins to denounce the prosecution of these freedom fighters. Activities are planned throughout the day to support the defendants, including a march later in the evening to begin at the old site of the confederate monument and end at the courthouse to greet the defendants as they leave trial. Local organizers and activists have continued to keep the pressure on the DA and Sheriff by coordinating call-in days to demand that all charges be dropped. Since the August 14 action, statements of support have flooded in from across the state and country. Excerpts of some of those statements are included below. “The statute and others like it are the burdens of Black People. This is our battle with history. These are brutal symbols of hate. The members of the Durham Committee on the Affairs of Black People are indebted to all advocates of change. We are grateful for the witness of millennials for taking matters into their own hands,” reads the statement released by the Durham Committee on the Affairs of Black People in September. In a resolution passed by the Durham Human Rights Commission, “The Durham Human Relations Commission affirms the community’s request for the immediate removal of all Confederate memorials, flags, statues, memorabilia, plaques, certificates, or any other commemorative objects which exist on city or county property.” The Commission also called for felony charges against the defendants be dropped. “Takiyah Thompson was paying attention, and took action, in the bold legacy of her/their ancestors. Now it’s our turn. Let’s organize, mobilize, and stand up for the future we all know is possible.” said Pierce Freelon, a 2017 Durham Mayoral candidate, in a statement of support. Steve Gillis, representing the Boston Bus Drivers Union in a solidarity message stated, “We send congratulations on the dismissal in January of the felony charges, and last week’s court victories for our friends charges in connection with the August 18 anti-Klan uprising! 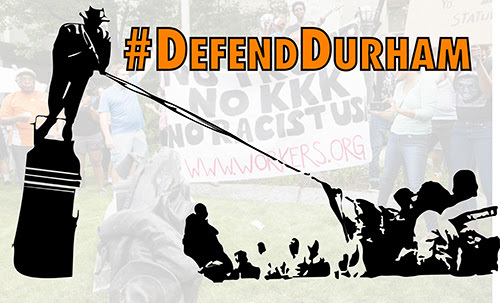 We are in continuing awe of your militant daring and organizational abilities in this sickening period of otherwise abject reaction and racist repression.” They are bringing a caravan of over 30 people to support the Durham Defendants going on trial. Text DefendDurham to 64336 for text message updates!